The New Cross C-Series: Pen or Sports Car? Car enthusiasts, get ready. Cross released a new collection, the C-Series, modeled after sports cars. The collection features fountain and rollerball pens in your choice of blue, champagne and black, with the black coming in two finishes. The body of the pen is inspired by sports cars while the appointments are designed to reflect lug nuts. The fountain pens are equipped with a twist off cap and a rubberized grip section for optimal comfort. To top it all off, the pen is finished with an 18 karat gold nib with rhodium plating. The rollerballs use a twist to engage the pen, and the capless design makes for a high tech look. As with the fountain pen, the body brings to mind a sports car, and the appointments scream lug nuts. The pen takes either gel ink or jumbo ballpoint refills, and both are included with your purchase. I know you’ve been eying that new Audi A5 and that Infiniti G37, but who has the money for them these days? The new Cross C-Series is a great alternative, and the price won’t give you that pit in your stomach…or wallet. Author ReneePosted on August 2, 2017 August 3, 2017 Categories Fountain Pens, PensTags cross, Cross C-Series, Cross Pens, Fine Pens, Fountain Pens, Pens, Rollerball Pens, Writing InstrumentsLeave a comment on The New Cross C-Series: Pen or Sports Car? Ah…..falling in love, there is no feeling like it! Racing heart, sweaty palms, the sensation that you are just going to burst at the seams with excitement. You cannot get enough of him or her, all day, every day. They occupy your every thought and boy does it feel great!!! Come on you remember, don’t you? It has not been that long since you’ve experienced the high?…..Even if you are deeply committed and truly love the one you’re with; whether you have been together one year or fifty, it is time to recapture that giddy feeling, reignite that flame and fall in love all over, with that special person in your life! Valentine’s Day is approaching fast and what better time to start the ball rolling! Come on life is too short, let’s give it all we got!!! You cynics out there who say Valentine Day is a Hallmark holiday, so what, who cares; why not take advantage of it anyways, take the opportunity to get back that gosh darn fantastic feeling when you first fell in love!Below are some great Valentine gifts she will just love and they won’t be gone in a week: the Andrew Philips Leather Heart Shaped Paperweights; luxurious red and pink pens from Faber-Castell, Waterford, Aurora, Cross, Waterman & more; exquisite red and pink leather wallets, agendas, totes and briefcases from Lodis, Knomo, McKlein and Clark & Mayfield; or even a fun red or pink umbrella from Shed Rain and Knirps Umbrellas. For that special guy in your life this Valentine’s Day: Piel Leather Golf Accessories; Bey Berk Bull & Bear Bookends; Clava Leather Wine Carriers; extraordinary fountain, rollerball and ballpoint pens from Montblanc, Namiki, Cross or Waterman; or top quality leather briefcases, messenger bags, wallets, portfolios and more. Falling in love….ooooh what a feeling! Happy Valentine’s Day from Executive Essentials! In 1846, in Providence Rhode Island, a family with a history as jewelers turned their attention to the creation of gold and silver casings for pencils. This started Richard Cross and his family down the path of creating one of the most successful and distinguished pen companies of modern times. The Cross Pen Company continues on today with a wide variety of ballpoint and fountain pens in the mid-price range. One of their longest running and most popular lines is the Cross Townsend. The Townsend was created for those who value individuality.This unique pen line embodies the classic American elegance and finesse of 1930’s Art Deco design. Every pen in the lineup has distinctive finishes, precious metals and the signature double band that has become a moniker of the Cross brand. And to top it off, the Townsend, like all Cross pens, delivers a lifetime of smooth, effortless writing. But don’t take our word for it. Just ask President Obama. Back in 2009, then President-elect Obama ordered specially designed Cross Townsend black lacquer rollerball pens to sign his inaugural documents. 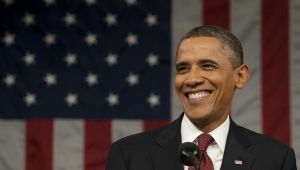 The pens came complete with the presidential coat of arms and included the now President Obama’s engraved signature. These Townsend rollerballs are still available (sans the presidential coat of arms and engraved signature) at a price that can’t be beaten. But presidential accolades aside, the Townsend Collection is full of fine pens in many styles and designs. So take the time to look over this fun and reliable brand of pens. I’m sure you will find a few that catch your eye and fit your budget. The only thing better than receiving one pen as a gift is receiving a pen set as a gift. Here at Executive Essentials, we have 29 amazing pen sets available from 12 different manufacturers. Like the single pens sold at EE, each of these pen sets is unique pens that hold a unique character and quality to reach a broad range of styles and interests. So, it seemed like the right time to browse the EE catalog and pick out my top 5 favorites and tell you what they are all about. So sit back and relax and feast your eyes on these great executive pen sets. I wanted to start with this pen and pencil set from Cross, because I couldn’t believe the price when I saw it. Cross makes a wide range of wonderful pens and pencils, but getting two for $20 just blew me away. I know that these are on the lower end of the pen spectrum, but a cross pen from any part of their spectrum is a worthy investment. This set comes in polished chrome with gold appointments to provide a smooth, elegant writing experience. My daughter’s birthday was on the 10th of this month and I’m sad that I didn’t see this pen set before hand. Even though at 10 years old she has long outgrown the Disney princesses obsession she is still a sucker for Tinkerbell and all fairies. In fact, she makes fairy food out of clay for her small fairy home filled with her tiny fairies. It’s a fairy world up in here. Regardless of if you are a true lover of fairies or just a casual fairy friend, this whimsical Disney pen and pencil set is a perfect addition to your writing instrument collection. And the price is just right for those younger writers who might not have the best pen care habits at their young age. Visconti writing instruments are handmade in Florence, Italy from precious and unique materials. With an eye toward re-discovering and preserving forgotten artisan traditions, toward devising and implementing advanced technology, and toward fitting inspired form to function, Visconti is the world leader in the design and technical innovation. This specific Ragtime pen set jumps up the scale from affordable to decadent, but the design and feel are worth it. This is a three pen set that includes an individual fountain pen, rollerball, and ballpoint. So much has been said about Mark Twain, that it’s hardly worth repeating. What is worth mentioning, however, is the blending of Montblanc and the Fabled American writer that used the mighty Mississippi as the backdrop to his novels and short stories. 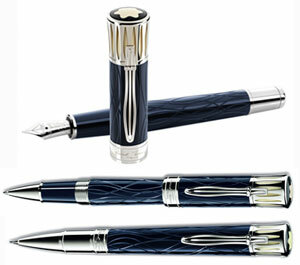 This exquisite fountain pen, rollerball and pencil set has look, feel and history. There are two different sets that have two different looks, but my favorite is the blue, which has all the qualities of Montblanc, with the color of Samuel Clemens eyes. Omas has a great pen ethic and I was happy to find this wonderful pen set made specifically for Weddings. Since North America is firmly entrenched in the wedding season it seemed only fitting to include this wonderful pen set as a unique wedding gift for those couples who love life and literature with equal passion. As wedding gifts go, this will be a piece that stands out for the bride and groom long after the casserole dishes have been sent off to Goodwill. These were just five of the 29 pen sets available in the Executive Essentials catalog. Take a look in the pen set section for many more unique writing instruments by world renowned manufacturers. The zebra is one of those highly distinctive and well-loved animals. And, even though they live in only one country, Africa, they are known worldwide. They are primarily known for their black and white striped coats which give them striking physical features. The pattern actually evolved as a defense against predators, which blurs the outline of the animal and confuses distance, making the zebra harder to hunt during dawn and dusk. And, although in a group all zebras may look the same, each pattern is as individual as a fingerprint or a snowflake. The zebra pattern has been lifted from the animal and used in fashion and design in clothing, furniture, and numerous other products. Here at Executive Essentials, we have several products that carry the distinctive zebra stripes including a few zebra print pens. In the world of accessories for women, the Cross Sauvage Zebra Fountain Pen stands high above the rest. Cross specifically engineered this one of a kind pen to suit a woman’s hand for writing by adjusting the balance and shape. The Sauvage features a curvy outline of silver and onyx that echoes the feminine form. The deep engraving of this pen mimics that of an exotic zebra print. This pen is hand-polished and is covered in a jewel-toned lacquer. It is tipped with an 18-karat nib. It’s been years since messenger bags replaced the standard backpack as the de facto carrying accouterment for urban dwelling individuals and the designs and styles just continue to expand and evolve. 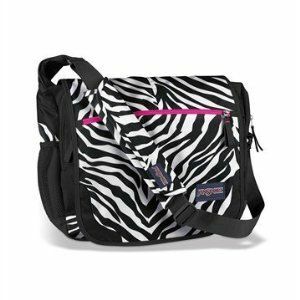 Case in point is Jansport’s Elefunk in zebra print. This is a great messenger bag for books, school supplies, or even hauling groceries from the Good Food Store. It comes complete with an adjustable shoulder strap with a removable pad, one large main compartment, an organizer that keeps essentials handy, dual side pockets with one for a cell phone and a fully padded back panel for cushioning comfort. Did I mention it has a zebra print? Classic! Retro 51 Pens goes 1980’s with this great Zebra print pen from their Exotic Animal Prints series. I am a huge fan of Retro 51. They know how to have serious fun when it comes to writing pens. Not to mention that many of their pens are extremely affordable for the quality you get in both the ink and the barrel. So slide in the Tears for Fears cassette, raise your bangs, cuff your pants and get your 1980’s on with this ultra fun pen. I don’t think I’m exaggerating when I say that nothing goes together better than an aluminum credit card holder and zebra print. The Ogon Credit Card Holder is a unique carrying case that allows men and women to carry the essentials in a pocket size case. Easy to find in a purse, it also fits perfectly in a jean pocket. The open fan-shaped compartments are functional in design and allow easy access to each card. The wallet features seven expandable pockets made of resistant PVC to fit up to 12 cards. The aluminum is made of water-resistant material and it has a simple button that makes opening and closing easy. Fashions, fabrics, and styles come and go like the tides. But some designs and patterns are timeless. Make sure to check out these and other great zebra print products from Executive Essentials. You won’t be disappointed. Every craftsman needs great tools to perform, create, design and produce. This is true of all professions from musicians to carpenters. And although high-quality tools cannot make an untrained craftsman an immediate success at their craft, it does allow them to move about in their field unhindered and unfettered by the physical world. Having the right tools not only bestows a crafter with creative freedom, but it can bestow a confidence that allows them to reach a higher level of achievement in their field. In the early years of the Beatles, Rickenbacker Guitar’s were their tools of choice. The Rickenbacker (starting out as Rickenbacher) Guitar Company started out as a collaboration between Adolph Rickenbacher and George Beauchamp. George was a vaudeville performer who was looking for a way to have his guitar project a louder sound so he could cut through the orchestras and bands he played with on the road. Rickenbacher was a designer and manufacturer. When the two finally met in the early 1920s, George’s ideas of how to amplify a guitars sound electronically and Rickenbacher’s innovation came together to form the first electric guitar. It was the clarity and expressive sound of the members of the Beatles to these extraordinary instruments. John Lennon was the first of the fab four to purchase and use a Rickenbacker guitar. It was 1960, in Hamburg, Germany, when he picked up a Rickenbacker 325 Capri. This was the famous guitar that he used on both original Ed Sullivan performances. In 1963, George Harrison decided to give Rickenbacker a try and purchased a 12-string model called a 360. This would be the guitar that heavily influenced the Hard Days Night album. Finally, Paul McCartney, perhaps feeling a bit left out, started using a 1964 4001S FD Rickenbacker bass on tour. Throughout the years, the Beatles would come to find their sound within these fabulous guitars and many others from the Rickenbacker brand. In the world of writing it is equally important to find a tool that allows you to explore your creativity without limits or distractions. Although Rickenbacker doesn’t make pens, Cross does and their new Year of the Dragon pens are proving to be as unique and exciting to pen aficionados as the Rickenbacker’s of yesteryear were to musicians. Cross’s new 2012 Year of the Dragon Special Edition Pens celebrates the coming Year of the Dragon in the Chinese calendar. The dragon represents the strongest and most majestic symbol in the Chinese Zodiac and Cross has a done an amazing job bringing the full weight of its experience and history to bear on this vibrant and exciting line. 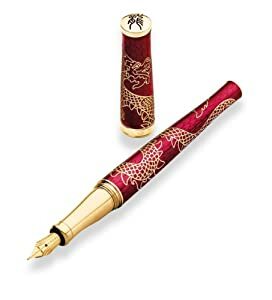 Each pen has a beautiful dragon design deeply etched into several layers of hand-polished lacquer – red or black – your choice. The pattern itself is appointed in 23 karat gold that glows with a shimmering, translucent scale pattern. The twist off cap protects the tip, which delivers a specially formulated ink that flows flawlessly and dries quickly. The Year of the Dragon Fountain pen comes with an 18 karat gold nib. In addition, the fountain pen as well as the Year of the Dragon Rollerball and Year of the Dragon Ballpoint all come with a lifetime mechanical guarantee, a charming display stand and a Year of the Dragon booklet. A great tool can inspire an artist to expand beyond their normal range of creativity. It can push them to new limits and cause a revolution in how art is conceived. Rickenbacker did this for the Beatles by giving them a guitar with a sound and tenor that fit the time and the feelings of that generation. Cross is here to replicate those possibilities for writers with their Year of the Dragon line of pens. Check out the Executive Essentials online catalog for more information about these pens and others that will inspire you to create more.